Thugs of Hindostan, India’s another big film in the direction of Vijay Krishna Acharya. Amitabh Bachchan and Amir Khan’s duo is a very very biggest news in Indian cinema. Actually, both are very interested in different films, so now both are appearing in one frame is really an amazing thing for Amitabh and Amir fans and movie lovers. As like that, Katrina Kaif coming with Amir once again after Dhoom3, and Fathima Sana Shaik who played the daughter role in Dangal movie, is playing an important role in this film. The getups are really superb. The dance moves of Katrina are deadly awesome. Recently, Amitabh and Amir made two videos for the promotional purpose. But here the interesting thing is both are talked in Telugu and Tamil. Really, it is a very happiest thing for their south Indian fans. Come to the trailer, the sets, the war fields, the getups, the visuals all are really marvelous. Every frame is looking rich and this film may have all the emotions itself. The fans and audiences are eagerly waiting for this movie. John Stewert’s background music creates goosebumps. 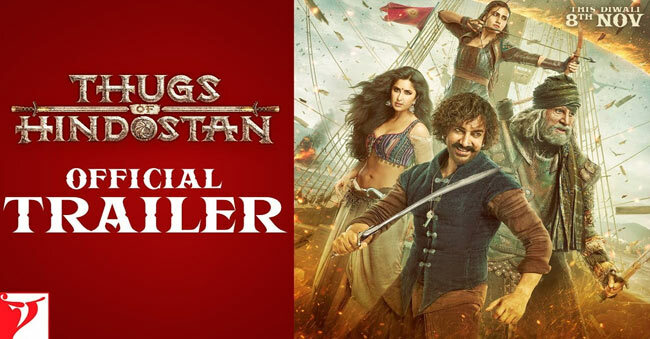 This film is based on Philip Meadows Taylor’s 1839 novel Confessions of a Thug, and about a thug called Azad, whose gang of thugs posed a serious challenge to the British Empire in India during the early 19th century. Now, the film tells a fictional story set between 1790 and 1805. It will also reportedly feature sea battles similar to ones seen in films such as Pirates of the Caribbean. Finally, the trailer is out on the occasion of Yash Chopra’s 86th birthday. Albeit, the trailer may release in Telugu and Tamil also.